A floor door is a great way to gain access to a mechanical pit or well. 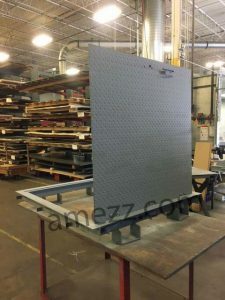 Floor doors are much safer than just laying a steel plate or wooden board over an opening, and they allow unimpeded traffic flow while not in operation. Compare that to locations that have permanent handrails installed around an opening and always reduce traffic regardless of use. Also, floor doors are counterbalanced to help open and close the door safely. Above you can see the counterbalance springs — they are the three cylinders mounted to the open door. Their quantity is dependent on the hatch material and size (i.e. weight of the door). There is also a hold open arm on the left side of the door to prevent the floor door from closing accidently. It also makes closing the floor door easier. At the top of the door is the slam latch. 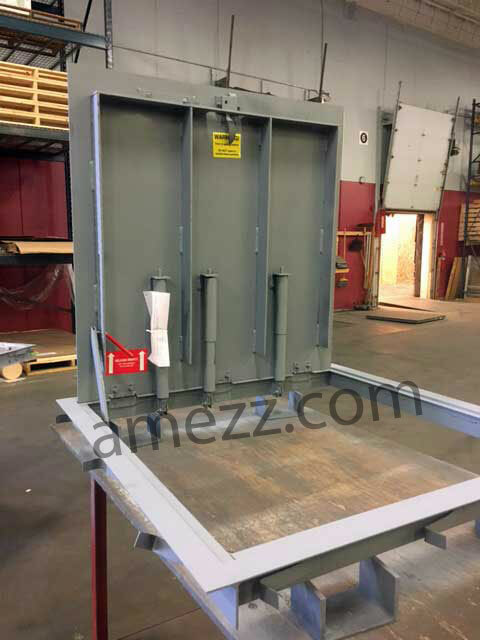 Simply close the door and it is securely latched. Around the bottom of the floor hatch there is an angle frame, as well as removable concrete anchor straps. This allows flexibility with the installation into existing locations as well as locations with a fresh pour of concrete. The outside of the door is a checker-plate pattern to provide some slip resistance. Some floor doors are also available with a recessed well in the door to allow carpet squares to be installed. Which way is best is up to the install location. 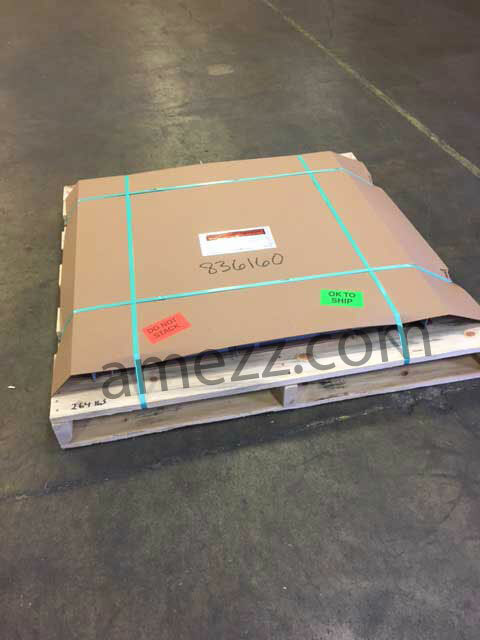 The check plate is easier to take a rolling load like a cart. The recessed well for floor tiles allows the hatch to blend in more with interior locations that already are carpeted. When used in an existing opening, the cover will sit above the mounting structure by ¼” – the thickness of the angle frame. Some installers leave that 1/4″ lip and some notch the floor slightly to make the floor door entirely flush. 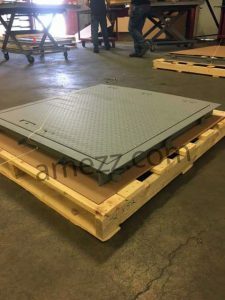 We can put all the greatest features into our floor doors but that doesn’t matter if the door arrives to you damaged, so they are never shipped loose. Above you can see the floor door safely wrapped in cardboard and banded onto a pallet with notes not to stack by the carrier. A little more time taken to make sure they’re packaged securely has helped eliminate almost all of the headaches that happen with freight damage and resulting freight claims. This entry was posted in Hatches and tagged Floor door on October 27, 2017 by Brett.